This entry was posted in Blogging, Eating Disorders, Family, Happiness, Healthy Eating, Other Stuff, Random Thoughts by txa1265. Bookmark the permalink. As always, the blog love is mutual! This time of the year, it’s easy to get bogged down, sick of winter before it even begins, and then the inevitable holiday hangover. Being aware that those things can happen makes it easier to consciously focus on the positive-because so many of us have much more positive than negative in our lives. It’s just remembering that the stuff we DON’T complain about is so much more of an effect on us than the negatives that eventually drift away. Absolutely agree … and this weekend we just had something hit that might add a bit of stress and it is up to me to mitigate it before it can do so. It always feels like there are these things, and this year we felt we’d set ourselves up for a great time. And I don’t plan to let anyone mess with that 🙂 Because it is all about focusing on what matters, what is important – and for us that is Lisa, myself and our two boys. Haha thanks for the shout out, and I like the excerpt you chose – a total TOL if there is one! Also, I love that quote on top. 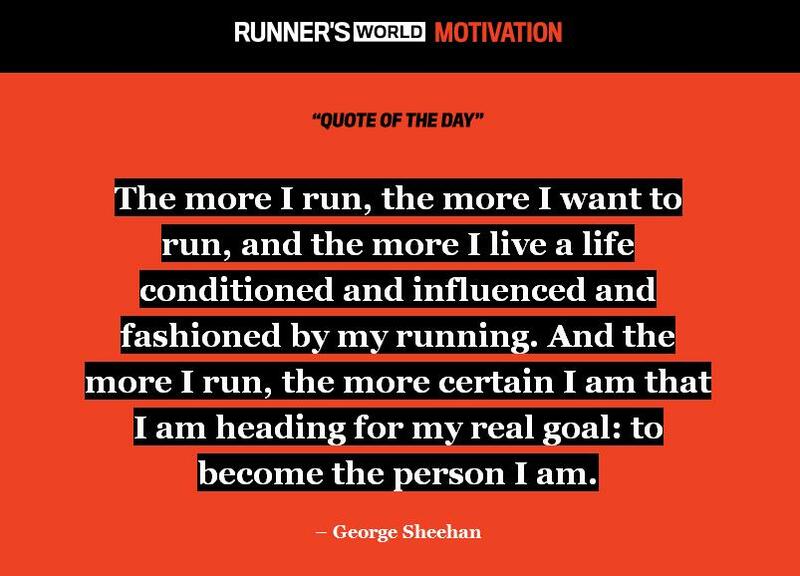 It’s just the reminder I need right now actually, the core reason why I fell in love with running! Thank you for posting all of these. Really impressive (and strong) ladies in out blogging world. Aww, thanks for the highlights! Reading over my email makes me seem overly enthusiastic, which I guess I am ;). But I really do think it’s just the perfect quote for you! Love some of these others, as well. You really do highlight a lot of great ones, and I’m honored to be included! I just had to say I like your tease about good things happening in your world, to be reported soon. Happy! These are some great highlights from the week, and thanks for mentioning mine! I would have loved to share the map of how my garmin made my run look but then people could figure out where I live- but seriously the map was crazy!! And that’s a great quote you shared in the beginning! True on the Garmin map – I think it is really important to maintain a level of safety, both in terms of being a woman running, but also for everyone because it can allow your house to be a target. Great posts. So real and raw and great coverage. I admire all of these authors and think they are also great writers to boot. Thanks for sharing and I completely agree with you. I read all of these posts this weekend and liked each of them. Thanks Hollie … I always think back to the crap you get on GOMI, and sometimes you and grammar have a rocky relationship – but don’t EVER let anyone tell you that you don’t make insightful comments on important stuff! Thanks Judith (I guess I didn’t realize I was lacking a like button because I get ‘like’ notices 😦 ). I always find your suggestions to be interesting/ good reads, thanks! I really appreciated this post. Sometimes it’s easy to get a little discouraged by the seemingly image focused nature if the blogword, and I needed a reminder that these are all my very supportive friends! Most of all, you. So happy for everything happening with your family. Hard work pays off, and it couldn’t have happened to better people. Aw thanks! These are some great people, and sometimes it is easy to get bogged down with all of the crap that goes on in the blog world. That has been a big thing for me – focus on all of the great people whose stuff I love, and weed out those I find myself gritting my teeth reading. It is sad when some of them are people I used to have good blog-relationships with several months ago. But as I have mentioned – I want people to call me on my BS and I plan to do the same … and it doesn’t always end well. Some people claim otherwise but are actually very happy in the insular world of all positivity 🙂 Personally I welcome constructive criticism. Looks like some great stuff happening in the blog world this week. Guess I should step outside my box and check out some other writers! Thanks Rachel – definitely loads of great stuff out there! Wow, a ton of interesting reads out there this week from some bloggers I don’t follow, so I am heading over to do some readings, thanks for highlighting some really interesting bloggers! I love finding new bloggers!! It is always a difficult thing – because we always want to find great new people, but sometimes when we’re struggling to manage the list we have, getting loaded up can be more difficult than inspiring! haha Enjoy!